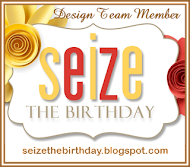 Welcome to the last Seize the Birthday challenge of 2017! Wow, that's hard to believe. This year seems to have flown by. This week we are have a theme of monochromatic for our birthday cards. I know you'd suspect red from me but went with green. Hope you like it! Hope you have a chance to play along with us. If not, we'll see you again in January! Please stop by the blog to check out the rest of the DT creations. Thanks so much for stopping by. Hope you have a terrific day and wonderful weekend. 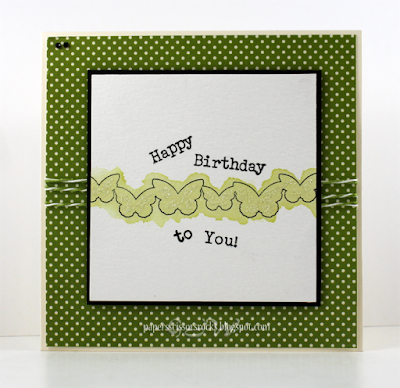 Love the polka dotted background and the greens! You had me at polka dots! Love your card Glenda! I hope you enjoyed your US Thanksgiving at your friends home! Have a great Saturday! Super cute! Love the row of butterflies and the playful orientation of your sentiment! This is so cute and cheerful with the dancing sentiment!! !